Universal Newsline - Business, Lifestyle, Entertainment : The New MINI. The New Original. Arrives in India. High-octane MINI go-kart thrills now come with the new MINI 3-door and the new MINI 5-door. For the first time in history, MINI introduces a new body variant with the new MINI 5-door. All-new vehicle platform, evolutionary design, new fuel efficient engines and more driving fun. Mumbai. 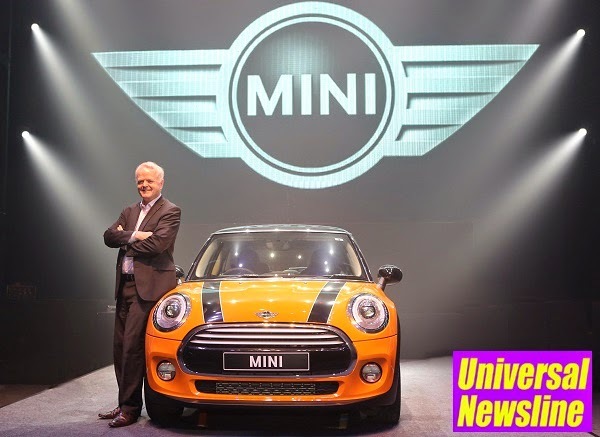 The new MINI 3-door and the new MINI 5-door were launched in India at a one-of-its-kind event held at the Mehboob Studio. For the first time in its history, the new MINI is represented with a 5-door model in the small car segment. The new MINI 3-door and the new MINI 5-door promise even more fun behind the wheel with an evolutionary refinement of product substance that enhances the unmistakable character, sporty and agile handling as well as premium style. The new MINI Cooper D 3-door and the new MINI Cooper D 5-door are available at MINI dealerships across India as CBU (Completely Built-Up) units from today onwards. The new MINI Cooper S 3-door will be available at MINI dealerships across India as a CBU (Completely Built-Up) unit in the first quarter of 2015. The new MINI brings an iconic design wrapped around 21st century features to change the face of roads worldwide. The latest generation of the MINI is once again a pioneer of individual style, premium quality and high-end technology. The evolutionary refinement of its design, entirely new engines and innovative technology systems make the new MINI more athletic, efficient, expressive and progressive than ever before. With no less than eleven colours to choose from, you can make your new MINI as elegant, sporting or extravagant as you want. Two non-metallic colours - Pepper White, Volcano Orange; and nine metallic hues - Moonwalk Grey, Blazing Red, Electric Blue, British Racing Green, Iced Chocolate, Thunder Grey, Deep Blue, White Silver and Midnight Black – shake up the existing colour range. Add some extra contrast to your MINI by opting for an Aspen White or Jet Black roof. The new MINI 3-door and 5-door. The MINI was made big by its size – or lack thereof. Everything about the new MINI too, has been designed to make it compact, agile and unmistakably MINI. Short overhangs and crisp proportions make the new MINI once again the greatest small car on the block. Every bit a true MINI, the new MINI is ready to conquer the streets all over again. The new MINI 3-door impresses from every angle. The completely redesigned front grille boasts big air intakes and a black honeycomb-patterned grid specific for the Cooper S. On the back, the air outlet housing two fog lights is wrapped around the double exhaust tailpipes. Proud red S badges on the front grille and back make a clear athletic statement for the Cooper S. Lighting the way are newly designed headlights and rear lights with full-LED headlights available as an option. For the side indicators, new graphics and a new insert play a big role in giving the new MINI its more mature look. The new MINI 5-door is the second body variant of the new MINI and reflects the car's historical roots as well as the evolutionary refinement of the contemporary vehicle concept. More doors do not mean less spice. In fact, the new MINI 5-door makes having five doors as exciting as driving the slickest coupe. The slightly longer wheelbase gives a distinct air of space. Scoring high on functionality and aesthetics alike, the interior of the new MINI is every driver’s dream. Step in and feast your eyes on the revamped dashboard. All driving related displays such as the speedometer and rev counter are placed behind the steering wheel, directly in your field of vision. The centre speedometer has been replaced by the all-new MINI Central Display which shows car information and entertainment. Increased interior space and foldable rear backrest with adjustable tilt angle make for further advancements in the area of functionality. Without sacrificing on driving excitement, the new MINI 5-door brings an additional kicker to the party: space, and lots of it. With comfortable rear seat for three, more legroom in the back and 50 litre more volume in the boot, you can bring your tallest friends and their biggest bags. Just when you thought we couldn’t possibly make the MINI any more exciting, we did exactly that. The new MINI TwinPower Turbo engines make the new MINI faster and lighter on fuel. Bustling beneath the bonnet of the new MINI Cooper S 3-door is the mighty 4-cylinder MINI TwinPower Turbo petrol engine delivering 280 Nm torque. Developed from scratch for the new MINI, it injects the MINI Cooper S with 141 kW / 189 hp of pure unadulterated go-kart fun. The MINI Cooper S is quick and only needs 6.7 seconds to hit 100 km/hr and its top speed is 233 km/h. The new MINI Cooper D 3-door and the new MINI Cooper D 5-door’s secret weapon is the state-of-the-art 1.5 litre 3-cylinder MINI TwinPower Turbo diesel engine delivering 270 Nm of torque. Punching down the accelerator delivers a power output of 85 kW / 114 hp. It has a top speed of 200 km/h and shoots from 0 to 100 km/hr in just 9.2 seconds with an insatiable growl. The standard six-speed automatic transmission provides improved efficiency, enhanced shift comfort and increased shift dynamics. The automatic transmission is combined with the automatic engine start/stop function to prevent unnecessary fuel consumption caused by idling at junctions or in congested traffic. With the all-new MINI Driving Modes you can change the car’s driving characteristics, interior lighting and engine sound to match your mood. You can switch to GREEN mode to save on fuel or dial it up to SPORT mode to test the speed and agility. If you want the best of both worlds, just leave it on MID mode and the vehicle will be on its best balanced behaviour. The new MINI is stacked with top notch safety technology. The standard safety equipment in the new MINI comprise front and passenger airbags, 3-point seat belts, Dynamic Stability Control, crash sensor, Anti-lock Braking System and Run-flat indicator. A MINI isn’t just a car. It’s a MINI. That’s why it's packed with features you won’t find in any other car out there. The new MINI Central Display is your window to the outside world. A pulsating hub of infotainment, it is also optionally available in the 6.5 inch display or the whopping 8.8 inch widescreen version. When hooked up to your smartphone with the relevant apps, MINI Connected provides an endless stream of digital information and entertainment. Follow your friends on Facebook, tweet about your travel destination or check in on Foursquare when you get there. Stay up to date with the latest RSS news feeds, stream music from radio stations from all over the world with web radio or look up the nearest pizza place via Online Search. The new MINI also comes with a dazzling array of high-tech options. Choose from features like MINI Navigation System Professional, MINI Connected XL, Wired package, MINI Head-up Display, Harman Kardon hi fi-system and LED headlights with cornering function. In 2012, the BMW Group introduced MINI as a premium brand in India. Presently, the MINI model range in India includes the MINI 3-door, MINI 5-door, MINI Convertible and MINI Countryman. MINI has established four exclusive outlets – Bird Automotive (Delhi), Infinity Cars (Mumbai), Navnit Motors (Bangalore) and KUN Exclusive (Hyderabad).